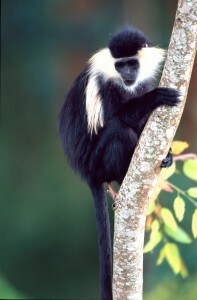 The Colobus monkey is easily recognized by its entirely black body with stark white whiskers, shoulders and tip of the tail. A troop of nearly 400 of these monkeys call Nyungwe National Park home, meaning that although sighting wild animals is never guaranteed, visitors have a good chance of finding them an hour or less into the trek. Social in nature, visitors will almost certainly experience playful interaction with the curious primates. Doing this trek will give visitors the opportunity to interact with the largest group of primates on the entire continent of Africa.